You are here: Home / home / It might be April Fools Day, but it’s no joke! It might be April Fools Day, but it’s no joke! 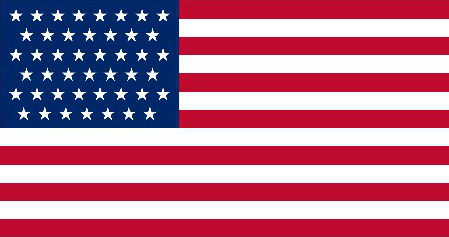 There were only 45 states in the U.S.
Our flag was short a few stars back then. The Cincinnati Reds finished their season 85-67 (we hope they do better this year!). In 1930 Leo Harnett of the Chicago Cubs broke the altitude record for a catch by catching a baseball that was dropped from the Goodyear blimp 800 feet over Los Angeles, CA. Good thing it wasn’t a bowling ball! In 1938, The first commercially successful fluorescent lamps were introduced and the baseball Hall of Fame was opened in Cooperstown, NY. In 1957, The Soviet Union launched Sputnik scaring the rest of the world for no reason! In 1960, The U.S. launched TIROS-1. It was the first weather satellite. In 1976, Apple Computer began operations. As you can see, we share a birthday with some pretty cool events that have happened in history. If you think those were cool, check out some of the things a little closer to home… We did say we are pretty old. The Boy scouts were established in 1910. -Fenway Park was built in 1912. War War 1 was from 1914-1918. Mount Rushmore was built in 1927. The FBI was established in 1935. The famous Ohio River Flood of 1937. The St. Louis Arch was built in 1963. Wow! How incredible is that!? We have had our doors open through a lot of cool events in history. Thank you for shopping local with Willis Music and giving us 116 great years! We look forward to spending many more with you and seeing a lot more cool stuff happen. Click here to read about the history of Willis Music. https://willismusic.com/wp-content/uploads/2018/05/Willis-Oval-and-Piano-Logo-2.png 0 0 Cybervise https://willismusic.com/wp-content/uploads/2018/05/Willis-Oval-and-Piano-Logo-2.png Cybervise2015-03-27 12:06:272015-03-27 16:09:08It might be April Fools Day, but it’s no joke!